U.S. Sen. Richard Blumenthal addressing the provisions of the new VA bill. Washington — With continuing scandals at the nation’s veterans’ hospitals, Sen. Richard Blumenthal and a Republican colleague introduced a sweeping new bill Thursday aimed at protecting whistleblowers and speeding the firing of bad actors at the U.S. Department of Veterans Affairs. “Almost every morning on the news we see a new story of our failure to our veterans,” said Sen. John Isakson, R-Ga., who co-sponsored the bill with Blumenthal. Isakson cited a report this week that cockroaches were found in the food of a Chicago veteran’s hospital. But for years, there’s been a steady drumbeat of reports of long waits for care or mistreatment of patients at VA hospitals. Most recently, a USAToday investigation found that employees at 40 VA medical facilities in 19 states and Puerto Rico regularly “zeroed out” evidence of veterans’ wait times for medical care. In some cases this practice was going on for as long as a decade. Facilities in Vermont, New York and Massachusetts were involved, but not Connecticut. 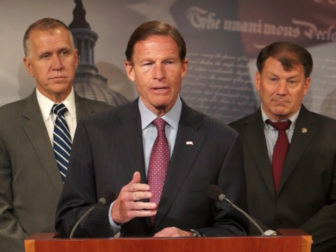 The Blumenthal-Isakson bill, which has broad bipartisan support in the Senate Veterans Affairs Committee, would allow the expedited removal of VA employees found guilty of misconduct, give the VA secretary additional authority in hiring and firing senior executives and reduce benefits for senior executives who have committed certain crimes. The bill also would create an Office of Accountability and Whistleblower Protection at the VA and give Congress more oversight of the department. “Accountability is vital to assure that veterans receive the care they deserve and to deter misconduct,” said Blumenthal, a member of the Senate’s veterans panel. The bill also would make it easier for the VA to hire community doctors, expand mental health services and increase the availability of medication to counter the effects of opioid overdoses. It also would expand the VA’s definition of homelessness to include veterans fleeing domestic violence. “This bill keeps faith with our veterans,” Blumenthal said. The window to approve new legislation is narrow this year, especially since Congress will adjourn early to allow for the national conventions this summer and lawmakers’ re-election campaigns in the fall. The sweeping reform bill may also find resistance in the U.S. House of Representatives over the cost of the legislation, and at the White House, which has raised questions over the effectiveness of the new firing rules. “I think it will move,” he said.